See what the daily and weekly chart analysis say. The price action on the daily and weekly charts suggest that February natural gas futures may have finally turned the corner and are now poised for a steep short-covering rally. Last week, the market extended its gains, reaching a two-week high, after data showed U.S. natural gas supplies in storage fell more than expected the week-ending December 18. According to the U.S. Energy Information Administration, natural gas storage in the U.S. fell by 32 billion cubic feet, more than expectations of a decline of 25 billion. Total U.S. natural gas storage now stands at 3.814 trillion cubic feet, 14.7% higher than levels at this time a year ago and 10.8% above the five-year average for this time of year. After a delay in the start of seasonal cold weather patterns sent prices down to levels not seen in a decade, updated weather forecasting models are now pointing to cooler temperatures across key demand areas in the central U.S. in the coming days. 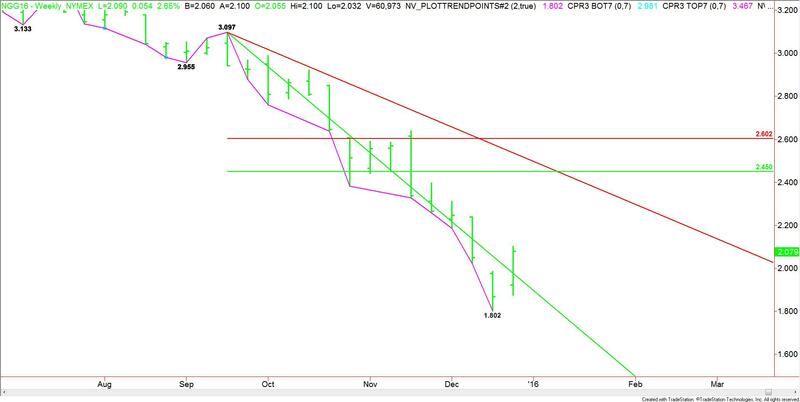 Technically, the main trend is down according to the daily swing chart. The main range is 2.637 to 1.802. If there is enough upside momentum then its retracement zone at 2.220 to 2.318 will become the primary upside target. The key to a rally this week according to the daily chart will be a sustained move over the downtrending angle from the 2.637 top. This angle comes in at 2.497 on Monday, December 28 and is moving lower at a rate of .005 per day, ending at 2.482 on Thursday, December 31. A sustained move over this angle will indicate the presence of buyers and could create enough upside momentum to reach the 50% level at 2.220. Currently, the short-term range is 1.802 to 2.100. If there is no follow-through to the upside then look for a pull-back into 50% of this range at 1.951. According to swing chart analysis, this current rally could be the real deal. The last rally took place between October 30 and November 16, or 11 trading days. The price range was 2.382 to 2.637, or 0.255. The size of the current rally from 1.802 to 2.100 is 0.298. Since this rally has exceeded the last rally in terms of price, the market is showing strength. The duration of the current rally is 4 days. If this rally can sustain itself for more than 11 days then we could see a powerful rally. According to the weekly swing chart, the main trend is down. However, swing chart analysis suggests the market may have turned a corner. The previous rally in September was 2.955 to 3.097, or 0.142. It lasted two weeks. The market is currently up 0.298 from the 1.802 bottom, indicating that price is leading the move. A rally greater than two weeks will mean the market is getting stronger. The close over the downtrending angle at 1.897 is another sign of strength. A sustained move over this level will indicate that buying is getting stronger. If the upside momentum is strong enough then look for the move to possibly extend into the major 50% level at 2.450 and a downtrending angle currently at 2.497. We’re looking at trading the long-side this week based on the change in momentum on the weekly chart. The expected cold weather pattern could lead to a gap higher opening, so use the daily chart for entry if you decide to chase the market higher. In this case, the market will have to sustain a move over the downtrending angle at 2.497 on the daily chart. If you want to try to time an entry then look for support on a pullback into the downtrending angle on the weekly chart at 1.897. Keep in mind that this is a holiday shortened week so we may not get the volume or volatility we need to sustain rallies.